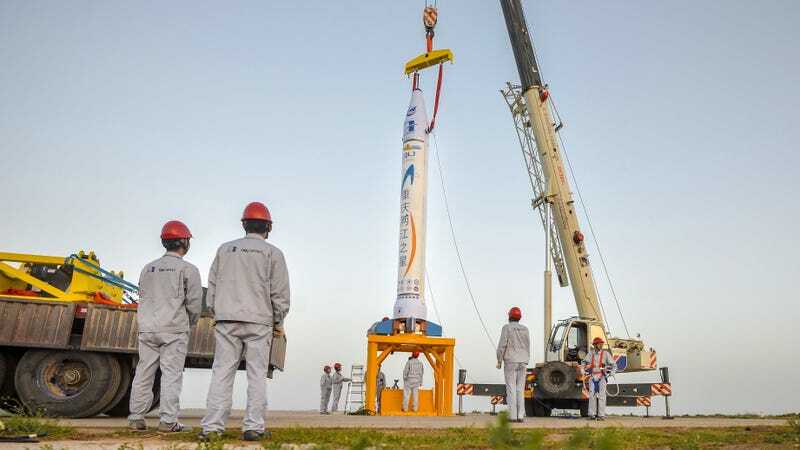 OneSpace Technologies conducted the first private rocket launch in Chinese history this week, firing off the 30-foot (9 meter) OS-X from a platform in northwest China on Thursday, according to CNN. The rocket reportedly reached an altitude of 25 miles (40 kilometers) and traveled some 170 miles (273 km) from the launch pad. The end goal is to be able to charge less than $10,000 a kilogram for cargo, part of an overall push from Beijing to encourage the growth of private space firms that can operate separately from the ambitious China National Space Administration but will also coordinate on some research and development projects if need be. Competitor SpaceX has sought to cut the cost of space launches with reusable rockets, and seems to be rapidly closing in on that goal with a series of successful tests. OneSpace may cost significantly less than SpaceX and it has aspirations of becoming the largest small-satellite launch companies in the world, but according to the Verge, OS-X is only capable of carrying 220 pounds into orbit—a drop in the bucket compared to the Falcon 9's 50,000+ pound capacity. It also uses solid rocket fuel, meaning components can’t be reused after launch. It’s not yet clear whether OneSpace will shake up the small satellite market. There is a rush of competition aiming at specifically launching small satellites, from big corporations like Virgin to small startups like Rocket Lab to mainstays like Orbital ATK, all of which are trying to grab ahold of a nearly half-trillion dollar global business. It’s also not clear whether US or other western satellite companies would be able to even buy a ride on a OneSpace rocket. The US government places strict controls on the export of satellites, which until a few years ago were still classified as weapons.